We have been looking forward to the 6 weeks build season and it has moved by quickly. The game this year involves manipulating and stacking plastic totes and a recycling container. The name of the game is Recycle Rush. 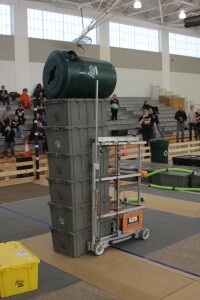 At the beginning of season we formed many design groups, each working on potential robot ideas and individual aspects of the robot such as the base or manipulator. Before we build anything we use CAD to model parts and ensure they will be the right size, and fit with other parts. Students used CAD for the drive base, elevator frame, and elevator components. Our programmers are mostly new this year following the graduation of a strong group. Programmers learned much about the new RoboRio through our beta testing process in the fall. The new control system was installed and tested on our 2014 robot and any issues were reported so the system would be ready for use in the 2015 season. This year’s students are also working on learning C++ and writing code for our new robot. We also have an app development group working on the scouting app for this years game. This app will be used to collect data on other teams to help us in alliance selections at competitions. The awards group worked hard on submissions for the Chairman’s Award and the Woodie Flowers Award. The Chairman’s Award recognizes the team that best embodies the meaning and purpose of FIRST. This award submission includes a video, essay, executive summary and a presentation. The Woodie Flowers Award is named after Dr. Woodie Flowers and recognizes an outstanding mentor. We have many dedicated mentors who have volunteered countless hours working with students and setting examples of Gracious Professionalism. We are very honored that 3 of our mentors have received this award and are hopeful to add another Woodie Flowers Award recipient this year. Our safety captain has been hard at work with a safety quiz, to insure that students understand and practice safety around the work site. He is currently creating a scavenger hunt of safety related items in our build site. Our fundraising group has been coming up with ideas to raise money for our team. This year we are selling LED light bulbs. These light bulbs save energy and lower lighting costs for customers. They are available in a 9.5 W (60 W replacement) and 18 W (100 W replacement) version. The cost for the bulbs is $11 and $20. This fundraiser opportunity is organized by FIRST and underwritten by Google. This fundraising helps to lower student costs for team trips. If you wish to buy light bulbs, please reply to this email, contact our faculty adviser (Mr. Swartley at Kenton.swartley@cfschools.org) or any team member. the opportunity to see our robot close up and ask questions about the robot construction. As we were about to leave, we learned that judge deliberations were taking longer than anticipated. 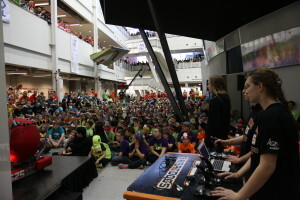 Organizers asked us to entertain thousands of excited students waiting for the judges to return. It was an amazing opportunity to share our enthusiasm for FIRST approximately 3,000 people! 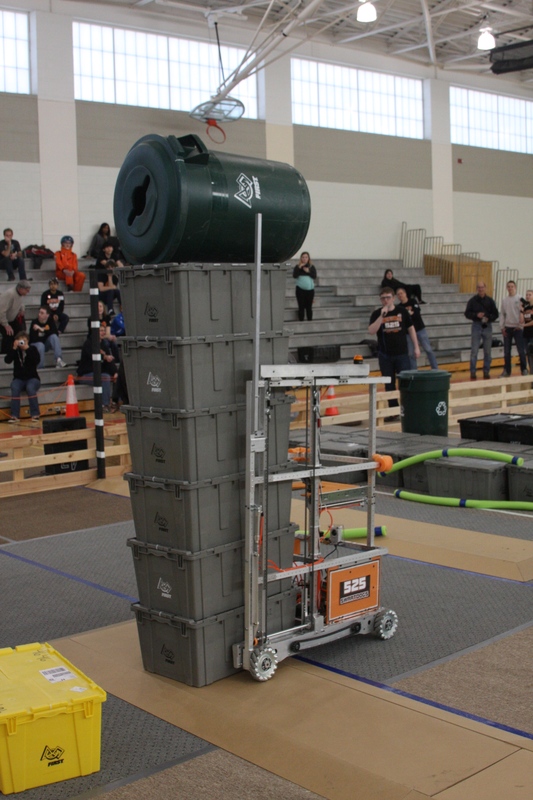 On February 14, the Swartdogs hosted a scrimmage for all Iowa FRC Teams. The event was held at UNI and sponsored by the RJ McElroy Trust. Seven Iowa teams attended and were able to test their robots and work out any bugs before the build season ended on February 17. The day was a huge success and we are now looking forward to our first regional competition, February 26-28 in Duluth, MN.